Obama’s Kenyan birth certificate: truth or hoax? A copy of a Kenyan birth certificate showing US President Barack Obama’s actual birth place as Mombasa, Kenya has been released. However, the authenticity of the birth certificate is yet to be confirmed. 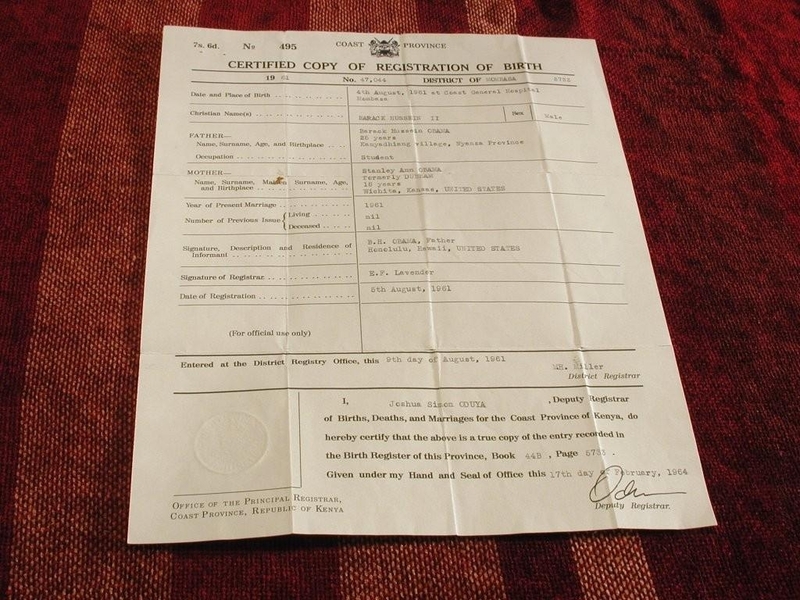 A copy of what is claimed to be a Kenyan birth certificate showing President Barack Obama was born in Kenya. What’s the big deal about Obama’s birth? Well, according to the Constitution of the United States, any person becoming President of the United States must have been born on American soil. This means that naturalized American citizens are not eligible for the presidency. If it is proved that Obama was not born in the United States, then his legitimacy as President will be cast in doubt. The matter is that serious. When it was announced that President Obama would give a major policy speech towards Sub-Saharan Africa in Ghana, there was considerable interest about what that would entail. US President Barack Obama addressing the Ghana Parliament. 3). The challenges that both conflict and corruption play in African affairs. Currently, Africa is seen by several countries as a place to explore new energy sources. It is also a place for new economic development as well. Therefore, the continent does have a role as an emerging market. But the President also stated that economic development depends on good governance. There are several countries in Africa facing economic turmoil due to unrest and other factors. In the speech, President Obama stated that the world must support strong democratic governments in Africa. Just what are considered to be the keys to success for a democratic government? Those that he highlighted include a strong parliament, honest police forces, independent media and judiciary, a vibrant private sector and a civil society. Health care is going to be a challenge for Africa. HIV and Malaria are serious issues that need to be taken care of. Since the George W. Bush administration, the US has provided billions of dollars not only to fight HIV/Aids but to provide life-saving medicines to those already infected. While In Ghana, Obama addressed an issue that normally doesn’t get reported that much: the recruitment of African doctors and nurses to work overseas. This creates a gap in basic Care. One of the areas of contention both in Africa and in the United States is the role of AFRICOM (African Command). The President stated that wherever there are global challenges, a global solution must be implemented. He then stated that AFRICOM would not be used to get a foothold on the African continent but will confront challenges to the security of Africa, America and the rest of the world. Just who was this speech intended for? There was ample praise for how the government of Ghana has respected the rule of law. As for security issues, both Darfur and Somalia were mentioned but the Democratic Republic of the Congo was not. Zimbabwe was mentioned twice as well but the Gambia and the Guineas were omitted. Obama mentioned the homeland of his father, Kenya, in less than glowing terms. All in all, Obama’s speech was good and on the surface appears to expand on the policies of George Bush. The last two weeks were interesting for those who follow US policy towards Africa, especially when two countries which have been thorny issues for previous administrations are at the focal point of discussions. First, let’s discuss the situation in Zimbabwe. Since the controversial elections in the year 2000, the country has gone from being the bread basket for southern Africa to being a basket case. Attacks on civil society, independent media outlets and the judiciary as well as poor economic conditions led the US and several other countries to levy targeted economic sanctions against President Mugabe and his ruling ZANU-PF (Zimbabwe African National Union-Patriotic Front). The election of March 2008 which President Mugabe lost was both a defining moment and the last straw. After a controversial runoff in July 2008, a GNU (Government of National Unity) was negotiated. Currently, Morgan Tsviangari, the leader of the main opposition party is Prime Minister and it is he who delivered the victory in Washington this week. President Obama broke with the policy of the Bush administration of isolating Zimbabwe by holding talks with the Prime Minister. This along with the fact that the US is going to allocate $73 Million in aid to Zimbabwe – with certain caveats – is a huge victory for the tarnished PR that Zimbabwe has become. However the US will still maintain its programme of sanctions currently in place. Also, in what can be construed as a defeat for Zimbabwe and its need for capital, the head of the CCA (Corporate Council for Africa) stated that there will be no US investment until the rule of law is restored and human rights are protected. The second defeat, which has the potential for direct impact on US policy, had to be the defeat of the Royce Amendment to the 2010-11 Foreign Relations Bill. This Amendment, if successful, would have declared the support that Eritrea is believed to be giving to insurgents in Somalia a threat to the national security of the United States. It would also declare Eritrea a state sponsor of terrorism. The question is: who was handed defeat by the failure of the Royce Amendment? If reports that the Ethiopian government spent thousands of dollars lobbying to have Eritrea labelled a state sponsor of terrorism are true, then defeat can be laid upon Addis Ababa. To take it even further, this can be seen as a defeat for the Transitional Government in Somalia as well. The score is split for Zimbabwe. Having the US interact with the government and providing any form of aid will be a victory as long as the security situation is resolved. But the unwillingness of US business to invest in Zimbabwe is a plain defeat. The failure of the Royce Amendment to deal with Eritrea has the potential to open the doors for another disaster in the Horn of Africa policy for the United States. Ugandan President Yoweri Museveni has long been a darling of the West, specifically the United States and United Kingdom, as a bulwark against Arab, Chinese and French influence in Central Africa. Uganda Peoples Defence Forces (UPDF) troops in training. Picture by Africom. It is worth noting that none of the world powers have condemned President Museveni’s moves at Migingo Island. Meanwhile, the actions of Ugandan soldiers in Kenya’s Pokot district have elicited absolutely no reaction from the international community. If anything, rather than criticize the actions of its favourite African leader, the United Kingdom has offered its colonial archives back in London to help determine the correct border between Kenya and Uganda. This is in sharp contrast to the situation back in the 1960s and 70s when Britain made it clear to Kenya’s neighbours that any sign of military action would be met with the full might of Her Majesty’s forces. Could this mean that Museveni’s actions have the backing of the West? If so, the implication is that Kenya has fallen out of favor of the major world powers. Even China is maintaining a loud silence over the matter. In any case, China is unlikely to risk antagonizing its relationship with the West by coming out strongly in Kenya’s defence. Thanks to tribal politics, Kenya is about to turn into a failed state. For this reason, the West has decided to act in preventing another Somalia-like situation in East Africa. Ordinarily, the usual strategy is to locate an alternative leadership within the country then support it in taking over the government. This strategy has been implemented across Asia, Eastern Europe, Africa and Latin America to install pro-Western governments. However, Western political analysts are of the view that all of Kenya’s current breed of leaders are beyond redemption. They are severely afflicted with corruption and insensitivity to the needs of the suffering masses. There is none among Kenya’s politicians who can provide a way out of Kenya’s mess. Vice President Kalonzo Musyoka, Prime Minister Raila Odinga, Deputy Prime Ministers Uhuru Kenyatta and Musalia Mudavadi are all blamed for driving Kenya into the snake pit of tribal hatred. The United States is extremely worried about the possibilities of a Rwanda-style scenario in Kenya. A few days ago, President Barack Obama and Tanzanian President Jakaya Kikwete held two-party talks where Kenya was discussed. Former US President George W. Bush also regularly consulted Kikwete over Kenya’s impending implosion and this was long before the 2007 elections. The US came under heavy criticism back in 1994 for failing to stop the Rwanda genocide. Since then, Washington is determined to pre-empt a repeat of the same in order to avoid placing American soldiers on African soil. With ongoing engagements in Afghanistan and Iraq, the US does not wish to have an implosion in Kenya. The growth of militant Islam in the Horn of Africa is already presenting nightmares to US strategists who fear that the failure of the Kenyan state would be a bonanza to Al-Shabaab and Al-Qaeda. The British also want to see a stable and peaceful Kenya due to their economic and strategic interests in the region. The UK government fears an influx of Kenyan Asians, many of whom already hold British citizenship. Faced with an impending crisis in Kenya, but fearful of committing themselves too deeply, what is the solution for the United States and Britain? That is where Ugandan President Yoweri Museveni steps into the equation. Museveni has for long been the West’s point man in the East and Central African region. He has made numerous interventions on behalf of the West in Sudan, Democratic Republic of Congo, Rwanda, Somalia and even Iraq. Museveni is an African partner that the US and Britain can rely upon to promote Western interests. US Presidents and British Prime Ministers make it a matter of routine to visit Uganda during their terms of office. Even the Queen of England has visited Uganda on more than one occasion. Since the 1980s, Kenya’s ratings in the West have been on a steady decline. No serving US President has ever visited independent Kenya. Hardly anybody remembers the last time Queen Elizabeth visited Kenya. For that matter, even British Prime Ministers have been giving Kenya a wide berth, only dropping by once they are out of office. It is obvious that the West has given Museveni a role to play in Kenya’s politics. There is more to Museveni’s intervention than meets the eye, hence his confidence over the Migingo and Pokot affairs. The question is: what does the West hope to accomplish in Kenya through Museveni? Is it possible that Museveni will in the near future decide who will be Kenya’s next leader, just like he changed the governments of Rwanda and the Democratic Republic of Congo? For sure, Museveni is fully aware that Kenya’s leaders are so divided that little action will be taken against him. President Kibaki sees the Migingo saga as a Luo issue that does not need military involvement. The fact that Prime Minister Raila Odinga is from the Luo tribe certainly plays into Museveni’s game plan, and will be used to show Raila’s impotence in spite of being the supervisor of government. Since the 20th of January of this year, there have been plenty of articles highlighting how the Obama Administration has been reviewing US policy towards several nations. Kenya Army soldiers with US military instructor. US military aid could dry up following wrangles in the Giant Coalition. In the media, Zimbabwe and Somalia are still popular topics of discussion. But there is one country that has not garnered a lot of interest in a little more than a year but is now re-emerging as a hot topic. During the historic campaign by President Barack Obama, Kenya was a keen observer of the electoral process in the United States. After all, President Obama’s father was from Kenya and Obama still happens to have family in Kenya. And there are several reasons for the United States to have a keen interest in what goes on in the country. One of the reasons is the current infighting in Parliament. The Obama Administration is not pleased with the current pace of reforms. There has been an impasse between the Vice-President and the Prime Minister that has caused debate to come to a gridlock. This has effectively halted any activity by the Government. Another problem that needs to be addressed is impunity. During the violence that permeated Kenya in the aftermath of the December 2007 elections, hundreds of people perished. There was also a report released by a human rights NGO that was critical of the actions by the security forces in the Great Rift Valley. To this date there has been no word regarding whether or not any member of the security forces will face justice for these acts. Another reason for the increased focus in Kenya is the Somalia situation. Most of the pirates that have been captured by international naval elements in the Gulf of Aden have been taken to Mombasa and handed over to Kenyan authorities. In the past, a Somali insurgent group has threatened to attack Kenya for assisting the international community in the struggle to rein in the acts of piracy. Since Kenya has a direct border with Somalia, this is a threat that cannot be taken lightly. The United States has always had good relations with Kenya. Now that the President is of Kenyan heritage it is perceived that US-Kenyan Relations will be in the spotlight on a larger than normal scale. Early last year more than one pundit lamented that Kenya has slid from being “A Model for Democracy in East Africa”. The concern that the US has for the current political impasse could cause Washington to tighten the purse strings when it comes to foreign aid to Nairobi. The Administration has been showing that it is not business as usual as it has placed sanctions on individuals that have been linked to corruption. One of the sanctions that has been enacted is to prevent them from travelling to the United States under any capacity. However, the US Ambassador has announced that the US will still support programmes that are administered by non governmental organizations (NGOs). The US Ambassador told a Kenyan newspaper that 85-90% of US aid is channeled through NGOs anyway. When Obama was elected President of the US, ordinary Kenyans were hopeful that the US would not forget Kenya. In that aspect he has remembered them.